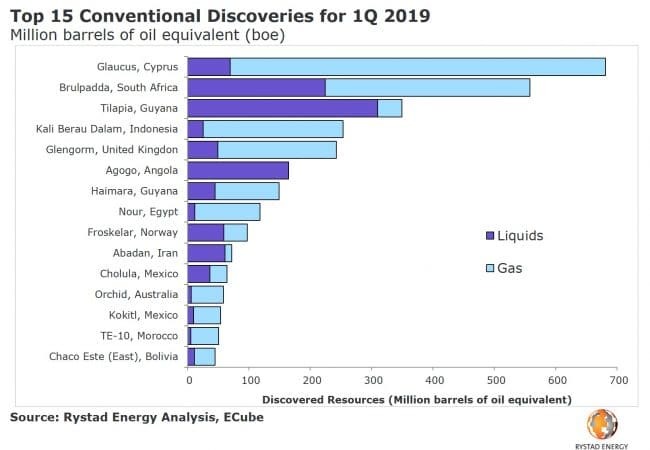 Glengorm and Froseklår are among the nine largest global discoveries in the first quarter of 2019. 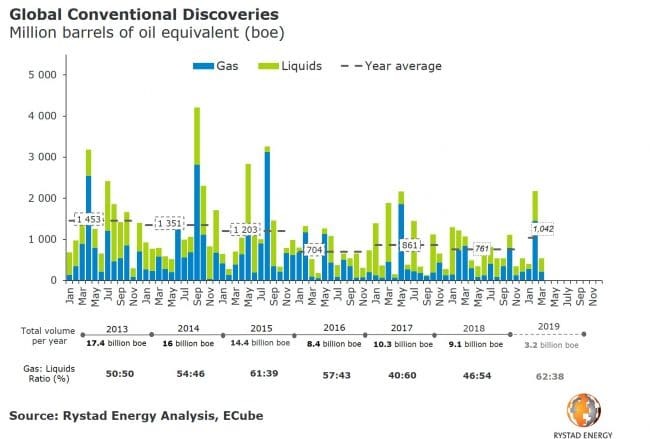 Some 3.2 billion barrels of oil equivalent (boe) were discovered world-wide in the first quarter of 2019, according to Rystad Energy. This compares with 9.1 billion boe discovered in total last year. Last year was, however, another disappointing year for global exploration. It was the fifth year in a row with declining discovery volumes (although 2016 was even worse). In 2013, 17.4 billion boe were discovered. If this should be repeated in 2019, exploration success must increase substantially compared to 1st quarter. Two discoveries in Northwest Europe is amongst top ten in the world: Glengorm (Glengorm geology) in UK and Froskelår (60-130MMboe in Froskelår) in Norway. The largest discovery this year so far is Glaucis offshore Cyprus. Some 700 million boe have been discovered, mostly gas.